His new baby brother who will be born in April! We haven’t yet settled on a name for our new addition but hopefully that will be coming soon. 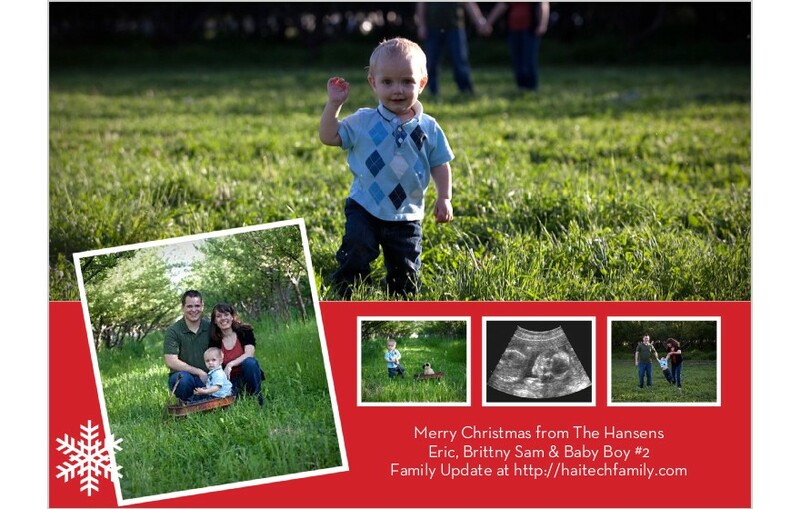 We’re excited to be adding another little boy to our family. Sam is especially excited and really wanted us to get the baby for Christmas, but we have since convinced him that we can have the baby for Easter instead. Sam spends a fair amount of time “playing with” the baby, by kissing my stomach and drumming on it etc. His new favorite trick is to put his hands on either side of my stomach and say that he wants to “carry baby”. Hopefully this enthusiasm will last after the baby is actually here. A new house! 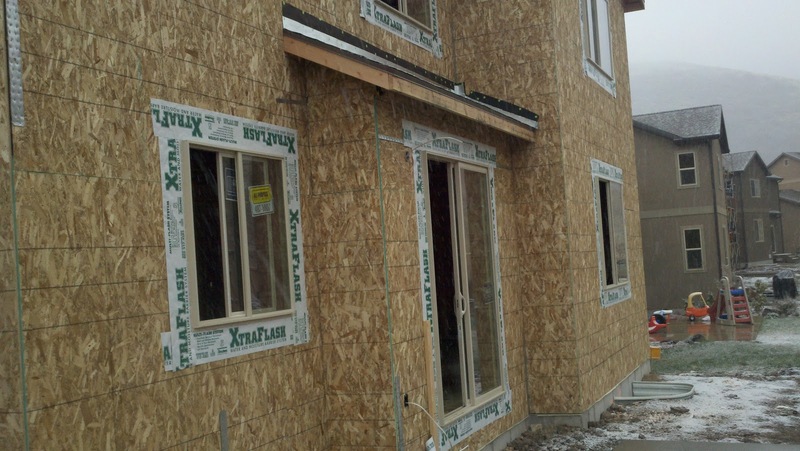 We are currently completing the construction on our first home. 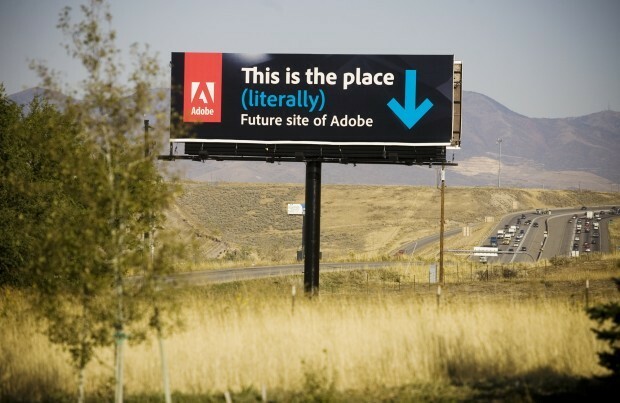 It is about 5 minutes from where the new Adobe campus will be. The house has a Draper address, although it’s on the Utah County side of the mountains (much closer to Highland, Alpine and Lehi really). We’re up in the mountains a little bit so it’s out of the bustle of the city and (more importantly) the pollution in the valley, but it’s not very far out of the way so we’re not stranded away from civilization either. We’re very excited to be moving in at the end of this year. So, that should about cover the main highlights of the year for us. We hope this season brings you joy, love and peace. Now THIS is a HOUSE! So if you follow our blog, you’ll probably remember that we weren’t able to take any inside pictures of our house last week due to the doors being locked. Well good news, we were able to have someone from the home builder come and let us in so we could give you all a proper update this week. And despite the risk of sounding like a braggart, I must say the house is looking really really nice! Our final walk-through of the place is this coming Thursday, and we’ve only found minor issues that need to be corrected so far. We’ll be keeping our fingers crossed. Assuming everything goes well, we will be closing on the house the following week! But I know why you’re here, so let’s see the pictures! It looks like Brittny’s choice in granite counter-tops worked out really well, after all! 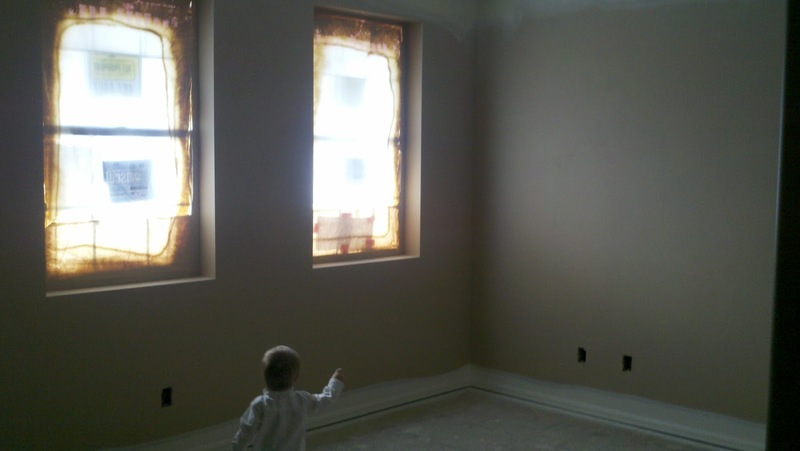 Everything looks great, and we are especially enjoying the warmer undertones that came with our chosen color scheme. Some of the lighting fixtures are more simplistic, but that’s because we are planning on replacing this room’s light with a ceiling fan fixture. We really like the nice amount of natural light that we get through all the windows, not to mention all the space we’re moving into! We’re keeping consistent with the warm color scheme found inside the house, and with the door painted, everything fits together very well. It’s hard to see in the picture, but we also now have a railing surrounding our front porch. Apparently it is part of the building code since our porch is so high off of the ground, and we’re glad to have it since we’ll have multiple youngsters running around the place. But all in all, we’re happy with the results! Hopefully we can find a time to have an open house for all our friends in the near future. No, not that kind of move. We still have a couple more weeks until we close on our new house, but we’ve moved to a new blog address! http://www.haitechfamily.com. We decided it was finally time for us to bid adieu to Blogger in favor of a WordPress installation on our own domain. There are a few reasons for this move. We wanted to have more control over what we were able to put on our blog and really make it a full-fledged website, rather than just a simple blog. We wanted to be able to have private posts that still show up on our RSS feed so when we had information that we really only want our friends to see we can hide it without the pain of being a private blog. (No offense to our friends who have private blogs, but I hate them because I always forget to go check them. I totally understand why people do it but they still make me sad inside). We wanted to be able to email our blog posts to more than 10 people. Since my mom and Eric’s parents and a few other people like to keep up with our blog via email rather than an RSS feed reader we like being able to have our blog posts automatically emailed to people who would like to have it come that way, without having to ask us to add them to a list and having to be very choosy about who could receive our emails. 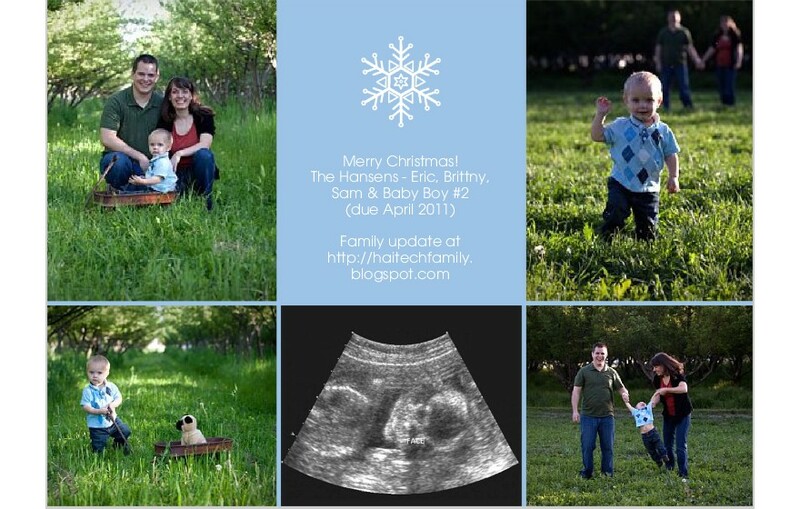 Most importantly, our Blogspot address didn’t fit nicely on our Christmas card We bought the domain name back in July so we’ve been meaning to make this move for awhile, but this was the thing that finally pushed us over the edge to complete the transition. Kinda dumb, especially since when all was said and done transferring everything took only a couple hours and I really love working with WordPress, but oh well. So, lots of different reasons for moving. If you subscribe to us using a feed reader then you shouldn’t have to change anything – the updates will just be coming from a different address now. But otherwise you probably ought to update your bookmarks and start following us at our new site! By the way, if you have a blogspot blog and would like to use WordPress for any of the reasons stated above, but aren’t tech savvy enough to host your own installation you can sign up for a WordPress blog and use it like you use Blogger. They host blogs at http://www.wordpress.com. And of course, I’m always available to help you set that up if you’d like. One of the last house updates before it’s done! Well, there isn’t much in the way of external changes to our house that we need to report on, but on the inside we could see some huge progress. Unfortunately, the house is locked and no one was in the office to let us in, so all we can show you are shots from the outside. So the most obvious addition from this shot is the garage door, and if you squint, you might also notice the coach lights installed to each side of the door. The landscaping won’t be done until the Spring for obvious reasons, so for now, the exterior is pretty much finished. 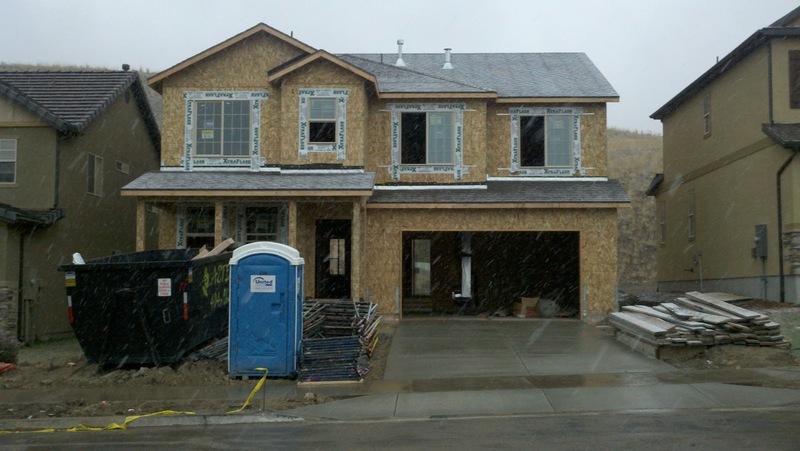 In the back, you can see a small concrete porch has been poured and steps installed leading up to the sliding glass door. If you look in the top left window, you’ll notice a light is on inside, and it’s true, we have electricity now! 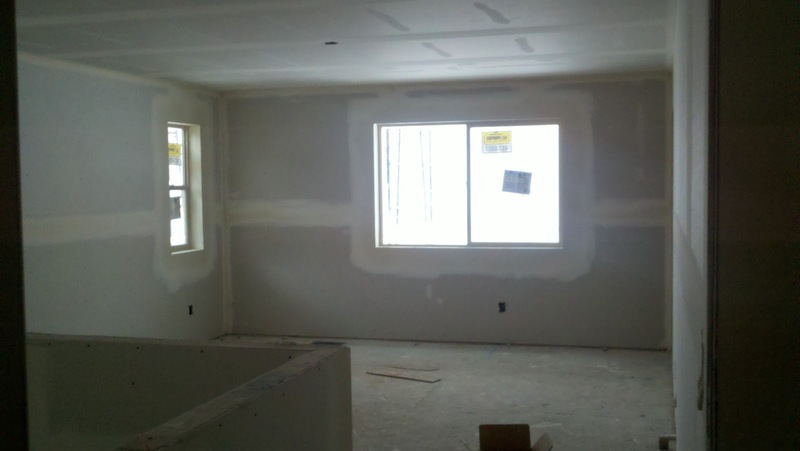 From our peeks in the windows, all of the lighting fixtures have been installed along with outlets and other details. Even some of the laminate wood flooring has been put in. It’s hard to believe that a week from Thursday we will have our final walkthrough! As Christmas rolled around this year I figured it was probably time for me to finally make a Christmas card for our family. I’d never done Christmas cards myself before. 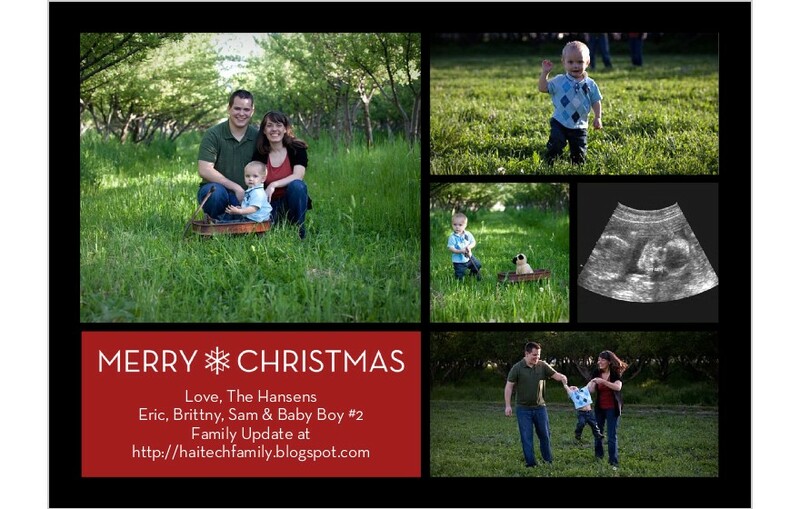 My family always put together a fun newsletter, but that seems a little silly for us since this blog is essentially a year-round Christmas newsletter. Most of the people that I would want to send an update to probably already keep up with our blog. But I found after last Christmas that I really liked having the Christmas cards from our family posted on my refrigerator. I think we had a picture at least from each of Eric’s siblings, which allowed us to have all of Sam’s cousins up on the fridge. Since some of them we don’t see very often it’s fun to be able to at least show Sam his cousins and teach him their names. So I figured if I was enjoying other people’s cards they might enjoy one from us as well. For not being a creative type these cards make me look pretty darn creative huh? If you want to make your own they have tons of different layouts. My sister-in-law just sent us hers and it’s a normal style fold-open card that has pictures and their full family update inside rather than just the postcard style. I thought it was really cute and a nice way to make a more formal card without having to write something individually inside every one. Plus a nicer way to do a family update without having to spend all the time printing it yourself and it looked nicer than a single piece of paper. 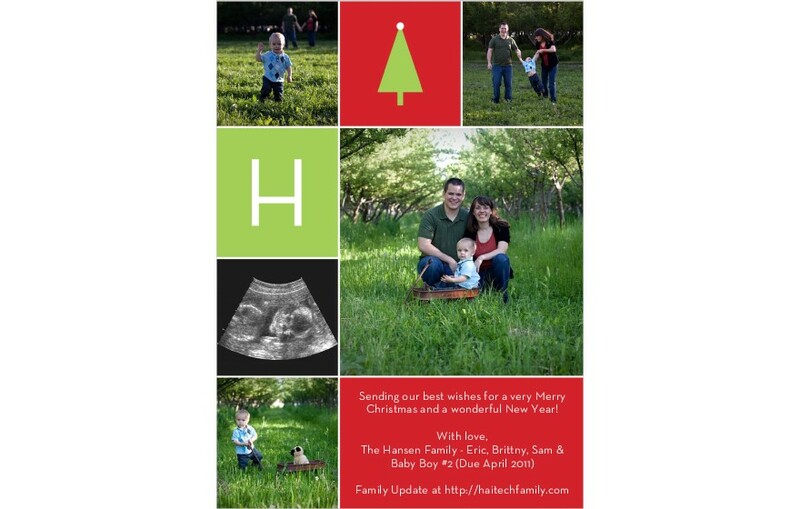 It was so easy that I’ll probably use their site again when our new little boy gets here in April to send out a birth announcement or recommend it to friends looking for an easy way to put together a really nice wedding announcement without too much hassle. The one thing I wish I had seen offered, which I think saw with one of their competitors, is the ability to upload your recipient list and have them mail the cards out for you. Obviously it was for a fee, but just to not have to address, attach postage and actually send out the cards myself would have been very tempting to me for sure. Correction: When I went through the checkout process again I discovered that Shutterfly *was* the provider that offered the mailing service. It cost $1/card sent out, which I think is totally reasonable, depending on how many cards you’re sending out. I decided against it since we want to have some extra money in the bank for house closing etc. and we didn’t have our Christmas card list finalized. But seriously, it’s only about 50 cents more per card than doing it yourself, if you’re just counting postage. You also don’t have to seal cards, address envelopes or get everything in the mailbox. I’m definitely a fan! The real kicker for me is that Shutterfly is currently having a promotion that if you write a blog post about their Christmas card collection and submit it to them they’ll give you 50 Christmas cards for free! If you’d like to participate you can get more information here. "Hey Honey, that looks like a pretty house, can we live there?" In a word… yes we can! When we drove around the corner to see our house today I hardly recognized it, in a good way. All the scaffolding was down and it looked a lot more like a house and less like a construction project! 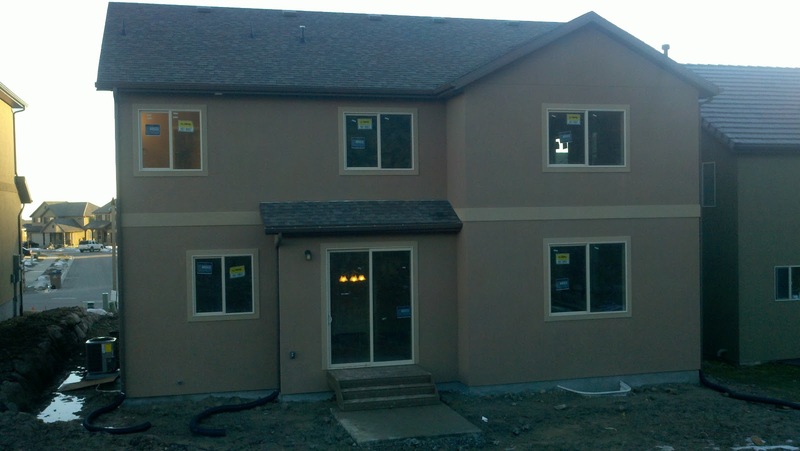 All of the stucco is painted and the masonry is up. 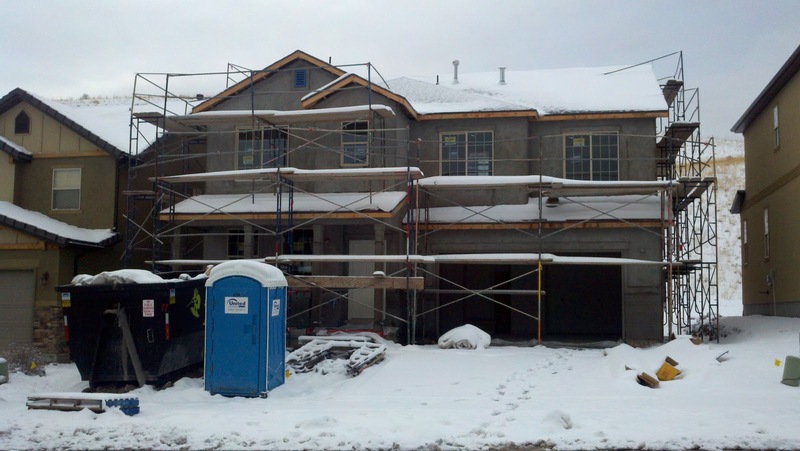 It looks beautiful and it’s really exciting to see the house start to get into the final stages of construction. In just a little over 3 weeks we should be living inside that house and we can hardly wait! The exterior, now in color! We had to try and keep Sam from touching things because they had been painting and we didn’t want him getting paint on his Sunday clothes… or anywhere in the house it didn’t belong. Our laundry room. I didn’t know we were getting shelving space in there, so I was pretty excited about that. 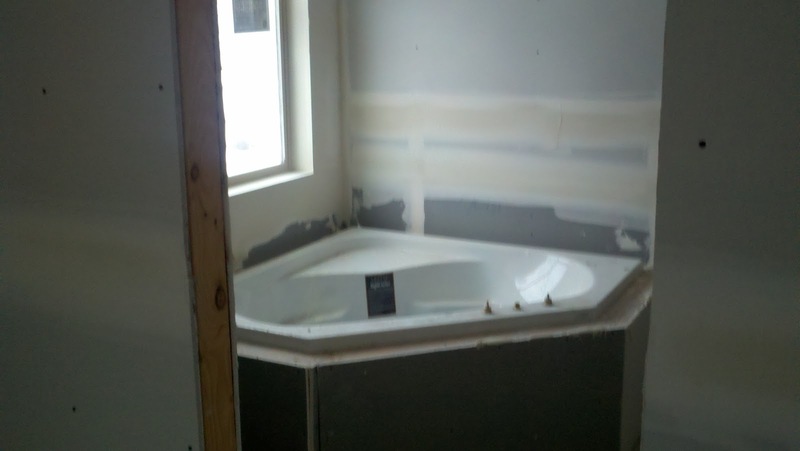 The kids bathroom, with the tub all covered in plastic wrap so it didn’t get painted on. 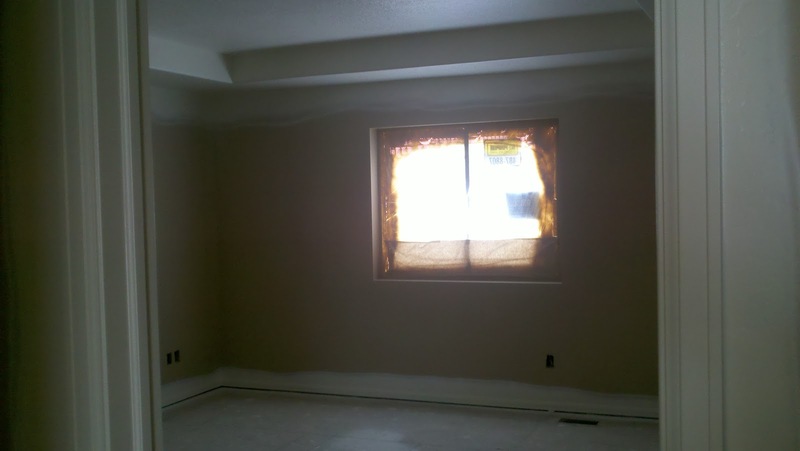 It’s amazing how much difference just having the walls painted makes. It suddenly looks a lot more like a home. I thought it was kind of weird though that it looks like they painted the walls in their final color, and then painted the trim in such a way that they’ll have to repaint the main walls again. But Eric pointed out that it means we’ll have more layers of paint which will be a higher quality paint job in the end. 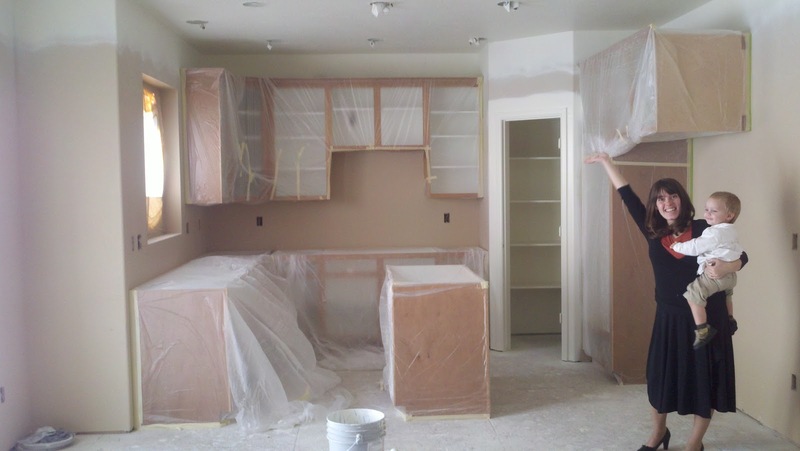 It was exciting to see the cabinets put in, even if they aren’t all finished. It really makes everything take shape a lot more, and I’m really happy with the color of them actually to scale. 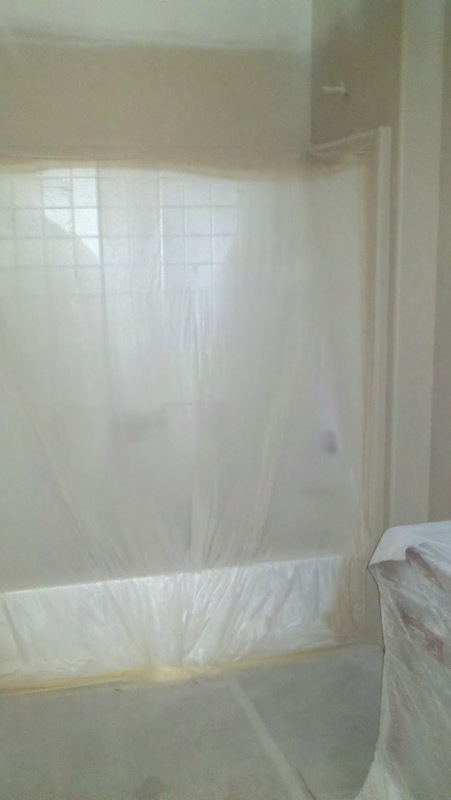 I know you can’t see the color of the cabinets too well through the plastic sheeting, but it turned out nice. 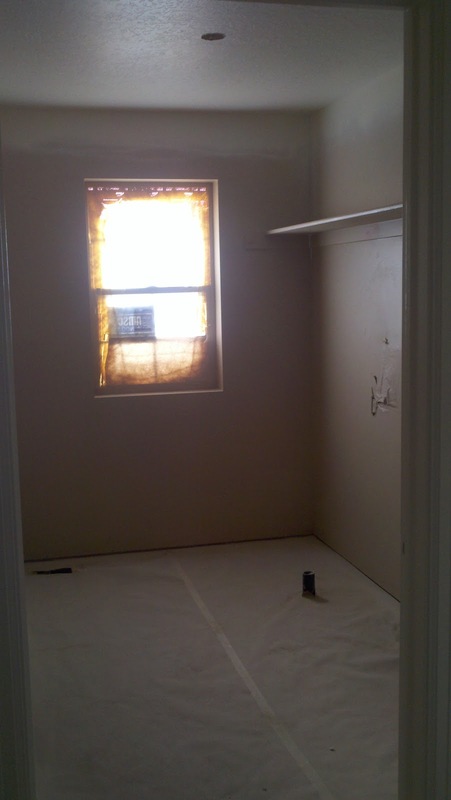 We’re excited to see even more progress when we go by next week! Well our poll for everyone to guess the baby gender is now closed. The results were pretty close – 13 votes for Boy and 12 votes for a Girl. Of course, the voting doesn’t matter since the baby is what it is. However, this time the majority was correct! We’re having another little boy! We’re excited for Sam’s little brother to join us in April. 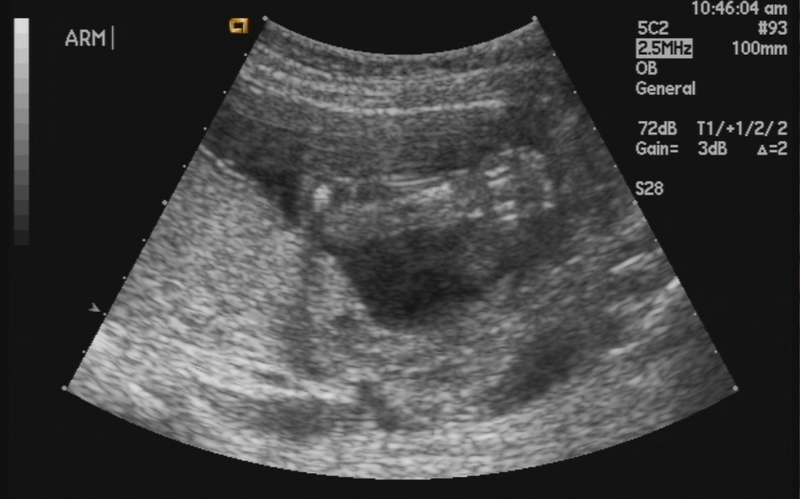 Eric has thought it was a boy from almost the moment we found out I was pregnant. 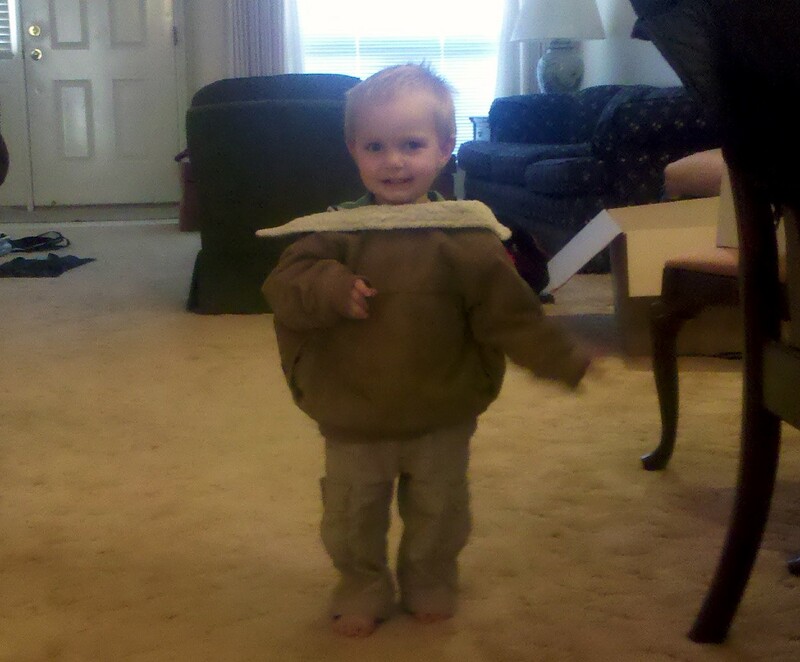 He thinks that the dad has an intuition about it, and so far he’s been right, so I guess I can’t really question that! Everything looked normal and good with measurements and health-wise which of course is the most important thing. 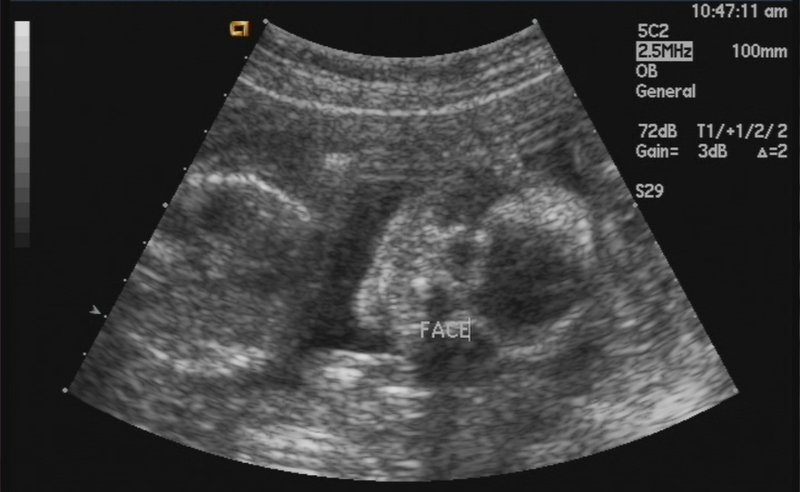 So, here are some pictures from the ultrasound. 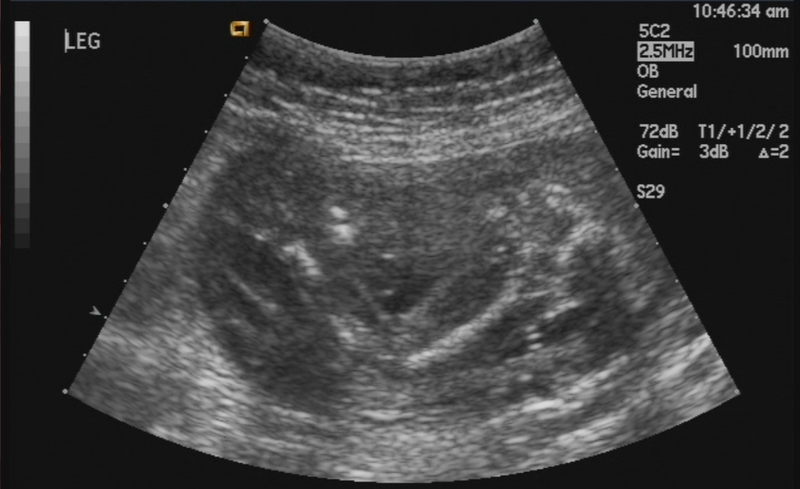 I think the sonographer went through a little bit quicker than usual so it seems like they aren’t as clear as they were with Sam. They’d had someone come in with a miscarriage this morning which I’m sure threw everything off. But I’m not upset, so long as the baby looks healthy and normal, that’s all that matters to us. 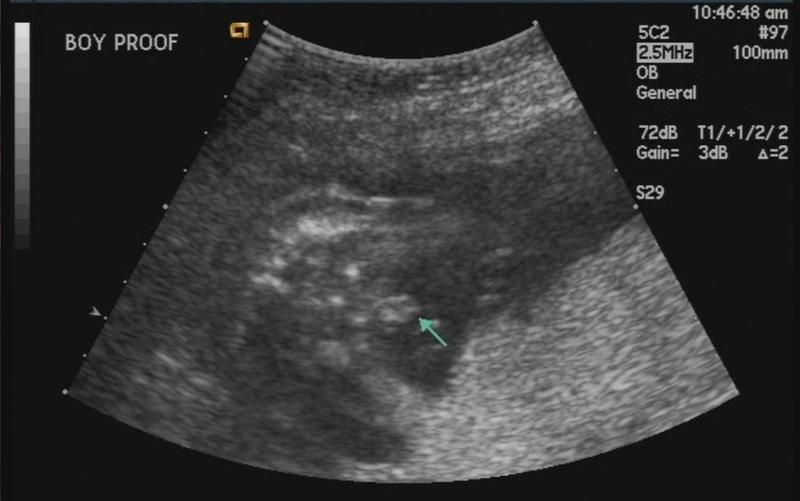 And, in case you just can’t get enough, here’s the video of the ultrasound. There isn’t any audio to it so you just have to watch the labels that the sonographer put in. You also might want to start in at about 1:05 over the part where she just writes in my vital stats. 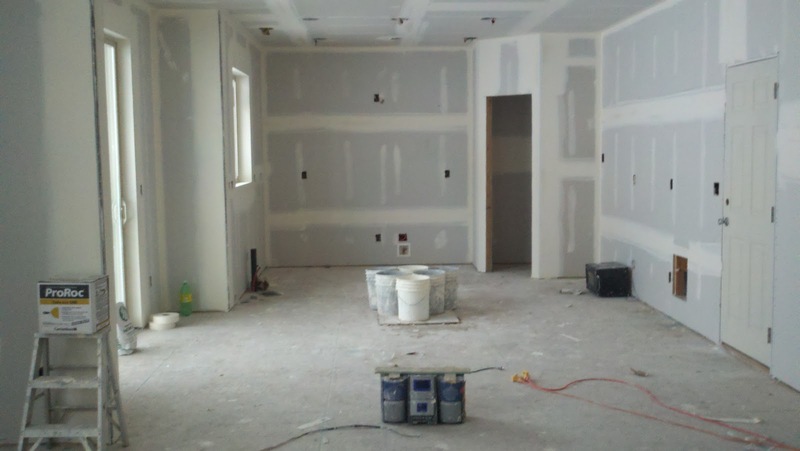 The kitchen area, now with drywall! 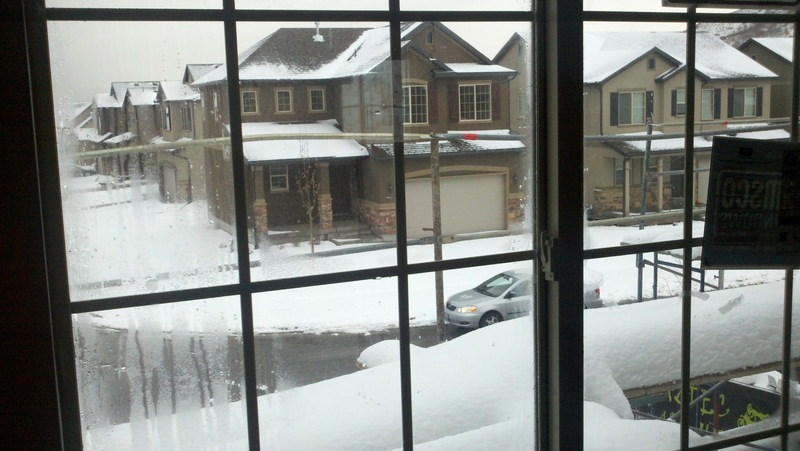 This picture doesn’t really show you the best view out our front windows, but we’ll get that one of these days. 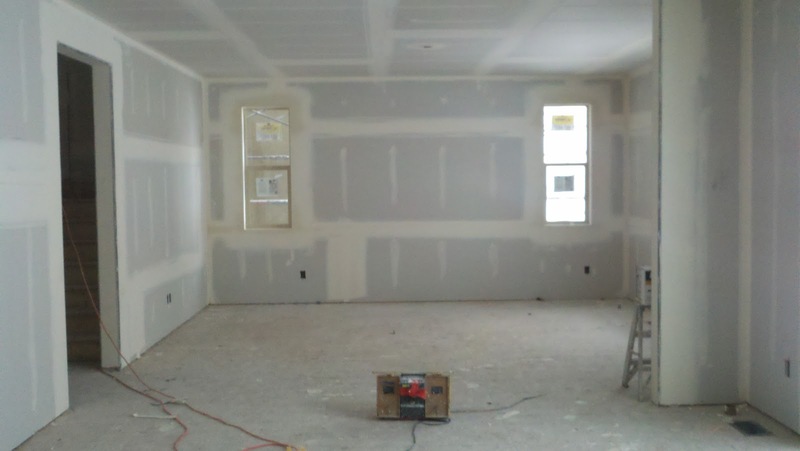 All of the drywall is in and our windows, doors and bathtubs as well. 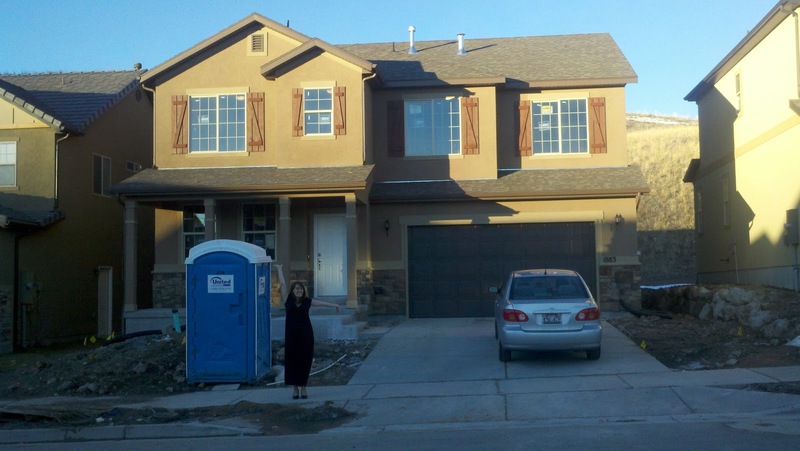 It really does a lot to make it look like a house rather than just a construction project. 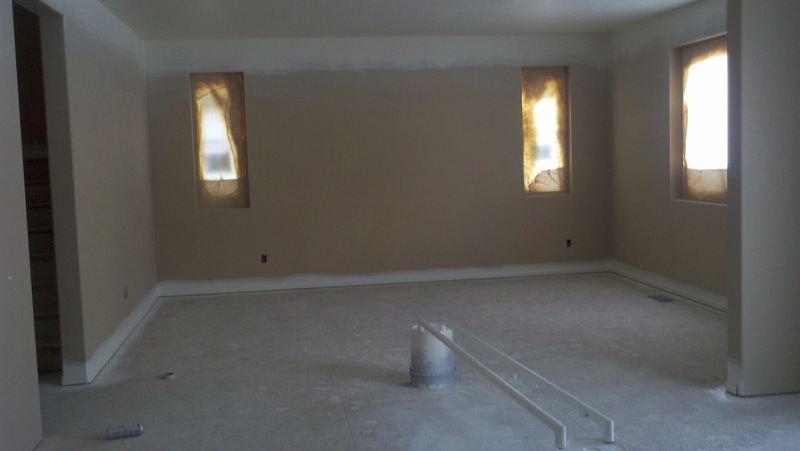 When we were up on Saturday they were texturizing the walls and ceiling so we think that means they’ll be painting in the next few days. We didn’t get any pictures this week because we were giving a tour of the house to my family and didn’t want to get in the way of the men working on our house. The outside is all stuccoed but it hasn’t been painted to its final color yet and the rocks haven’t been put on yet. I can’t remember what they’d said about when that part would happen but I’d think they’d want to get that done before it gets too cold. The most exciting part is – we have a closing date! We have our final walk through of the home on December 23rd and closing on December 29th. We were hoping to get in before Christmas so that we could do all of our moving in while Eric has his winter break, but we’re just glad to get in before the end of the year. We got a really great deal on our financing that will expire at the end of the year so we would have been really sad to lose that. I think what’s left now is painting, cabinets, sinks/toilets, electrical outlets (all the wiring is done, just putting the front plates on), lighting fixtures, appliances, and flooring. It seems like a lot, but at the same time it seems like as soon as the painting is done the rest of it can just kinda flow right in. I’m super excited to see what things look like when we go up again on Sunday. I feel like there’s likely to be some pretty major progress towards making it look even more like a home. It was kinda surprising to see his stats down so low. 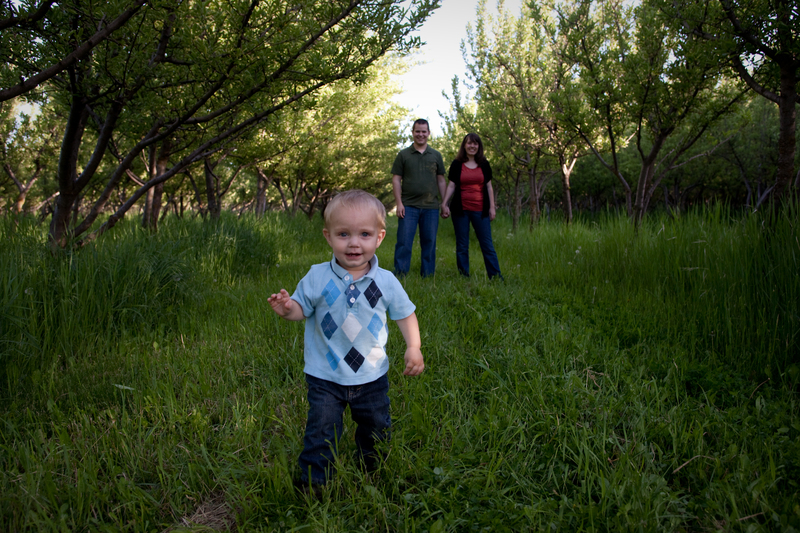 At his 12 month appointment he’d been in the 75th percentile for height and the 30th percentile for weight. Then he dropped off a ton at his 15 month appointment, but that one was right in the middle of when we were super sick in June and he’d lost a lot of weight during that time so I’d just chalked it up to that and I didn’t even record his stats at that appointment because they seemed like such an anomaly. Not that I’m really surprised to see Sam down in the 7th percentile for height, he doesn’t exactly have giants for parents, but it was just so crazy to see it go from 75th percentile to 7th. But, Sam is doing really well. The doctor said as we were leaving that he looked “perfect”, which is of course what we think, but it was good to hear someone else say it as well :) At every appointment our pediatrician gives us a little piece of paper that has some of the milestones that he should be reaching and things he should and shouldn’t be doing at his age. We were very surprised to see that they were looking to see that he had 10-20 words at this stage. That’s it?! I know people had told me Sam was a good talker but I hadn’t realized just how advanced he really is in that category for his age. I’d guess he has well over 200 words, but I really haven’t kept track at all and I don’t think I could track them all at this point. He speaks in little pidgin sentences with all of the articles, pronouns and other connecting words left out, but that’s apparently well beyond where he should be right now. We’ve really enjoyed Sam’s talking, and he talks all day long. The first thing he does when he wakes up is usually to roll over and start labeling all of the parts of my face – “mommy eyes! mommy nose! mommy mouth!” etc. Or he’ll wake up and ask for “juice?” until I ask him, “you want some juice?” and he’ll say “k, ready, set, go!” I’m not usually yet ready to “ready set go” but eventually we’ll make it up the stairs anyways and get him some juice. Some of his more fun phrases are “cool dude!” which he’ll say whenever he has a hat on, or sunglasses, or any number of things he thinks are cool. He also will say “awesome” when he thinks something is awesome. 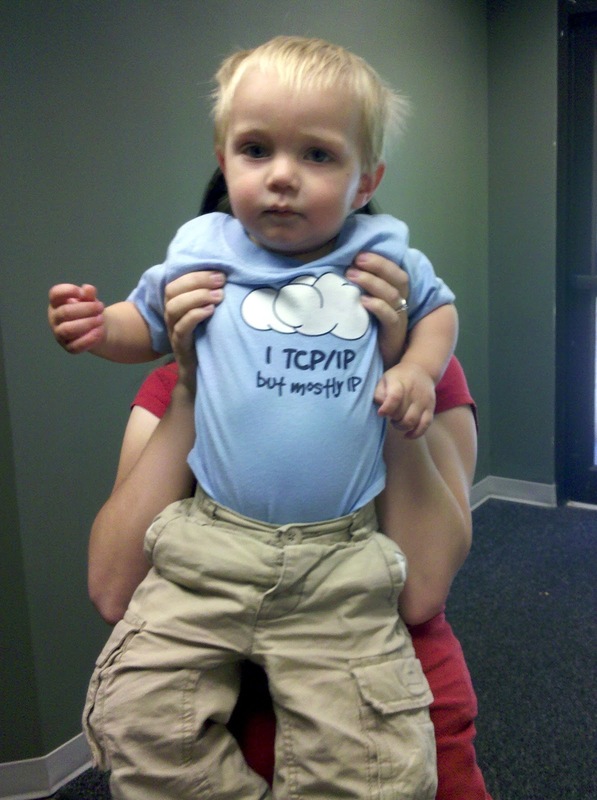 Recently we’ve taught him to be pinged (a computer term meaning the activity of sending out a request to test the responsiveness of a specific computer on a network). If he’s doing something that we want to just keep track of him without necessarily having to be in the same room then we’ll leave him alone and then periodically call out “ping!” and listen until he calls back “ping!”. Yes, we are super nerdy but we think it’s awesome. Right now he’s gotten all of his direct objects mixed up so he’ll say things like “hold you” “read you” “nuggle you” rather than “hold me” “read to me” “snuggle me”. We know it’s pretty typical but we think it’s pretty cute. He’s also started saying things like “mommy ask you” while signing “please” rather than just asking me for something or saying please. I’m guessing that comes from me asking him “how do we ask?”, and while the response I’m looking for is of course “please”, I really enjoy his “mommy ask you!”. I left Sam at the kitchen table to eat his breakfast cereal, thinking there was nothing for him to get into. I was wrong, there was a salt shaker there, what could be more fun than “shake shake shake!” all over the table? 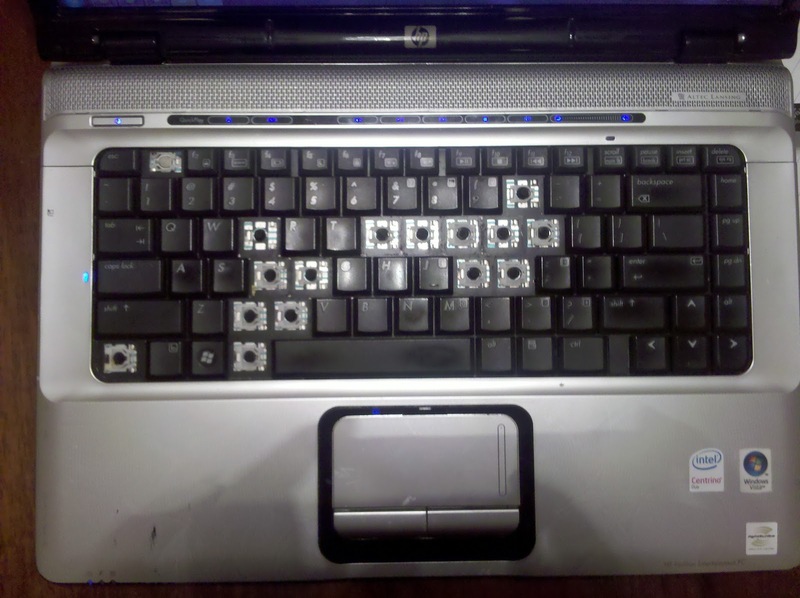 This is what happens to your keyboard if you leave your computer with Sam so he can IM his dad while you work on something in the other room. Yes, all of those keys got pulled off. And yes, they all did (eventually) go back on. 哎呀. Sam started going to nursery a couple months ago and he loves it. Unfortunately our ward meets at 1pm which is a terrible time for toddlers. It means that nursery is right in the middle of nap time and so we end up with a lot of cranky kids in nursery. Luckily Sam usually sleeps on the way to church and (if we’re lucky) through sacrament meeting so he’s a little bit better off. He’s still pretty clingy so we haven’t been able to leave him in there on his own just yet, but in all honesty I think I’ll be a little bit sad to leave him in there when he is ready. It’s really fun to watch him play in there and have fun. His favorite part is singing time, in fact I think it’s his favorite part of the entire week. Sam loves “yugic” (music) and so 20 minutes of singing with props is about the best thing ever. He knows some words to a few songs and it’s pretty fun to watch him sing them. He will randomly sing out “Jingle bells jingle bells” throughout the day, and whenever my mom calls him he likes to sing “Nobed” (Once there was a Snowman). He still loves “5 little monkeys” but he hasn’t quite caught on to the concept that we have to decrease the number of monkeys with each verse. If we start with 5 monkeys then he wants 5 monkeys for all 5 verses, or if there are 3 monkeys at the beginning then we stay with three monkeys all the way through. One of the interesting things in nursery is that Sam is still kinda shy, but he really likes being with the other kids. He’s pretty good at playing with other kids and sharing with them. One of the funny things is that if another kid comes up and steals a toy from him, he doesn’t usually get mad or anything, he just watches them like, “why did you do that?”, and then goes on to do something else. He’s not too easily ruffled which I think is an awesome quality to have, and definitely not something you can just teach a child if they don’t come that way naturally. This was actually Sam watching General Conference, not Ni Hao Kai Lan. He was so excited by the choir’s singing! 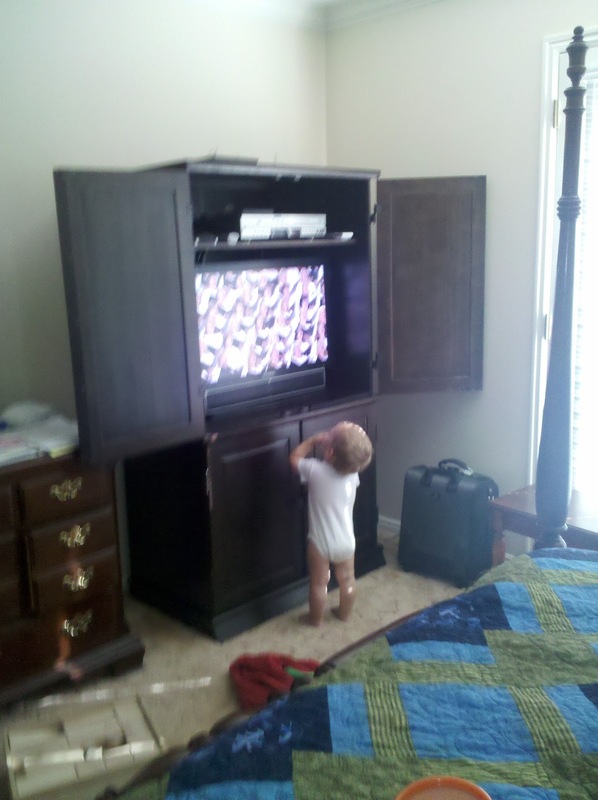 Sam’s favorite TV show is “Ni Hao Kai Lan which has been fun since it teaches him some Chinese. I’ve actually been amazed at how many words he’s learned both English and Chinese from the show. I knew that he could count to three in Chinese but then one day he surprised me with knowing all of the numbers up to 10! I don’t even know where he got that because I haven’t seen any of his episodes that counted higher than 3, but it must be in there somewhere because somehow Sam knew it. 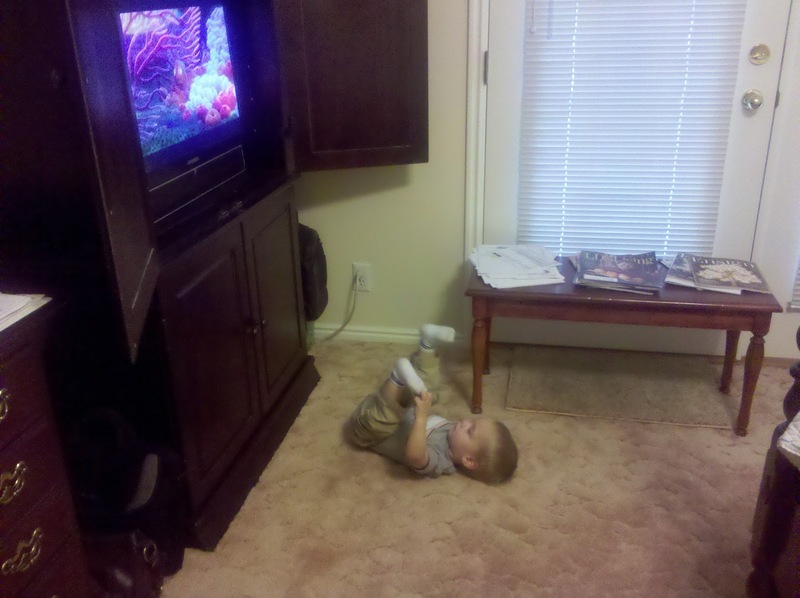 His other favorite things to watch are “Finding Nemo” and “Journey to the Promised Land” (a scriptural DVD). It’s kinda funny that his 3 DVDs that he watches he calls “Ni Hao”, “Nemo” and “Nephi”… all “nee”s. Oh, and for those of you who have been following our sleep saga with Sam, he’s suddenly become a great sleeper. I’m not sure exactly what changed but he’s gone from taking mini cat naps and needing someone with him all night long, to taking 2-3 hour naps and sleeping on his own! Plus he’s gone from needing to be nursed to sleep to just deciding he’s tired and falling asleep. It’s been amazing! Oh, and he’s also now weaned, which is something I’d started to think was never going to happen. I wasn’t in any hurry to wean him, but I’d slowly been transitioning him to a more solid diet after his first birthday. When we got the flu back in June it really did a number on Sam and every time I’d try go back to feeding him solids he’d just puke them back up. So I went back to nursing him exclusively and giving him some Pedialyte. It took a few weeks for him to get completely over it and by then we were in a routine of nursing that was difficult to break out of. Then we were moving and going on vacations so it was just easiest to keep nursing him since it meant I didn’t have to remember any extra foods or sippy cups, just the nursing cover. 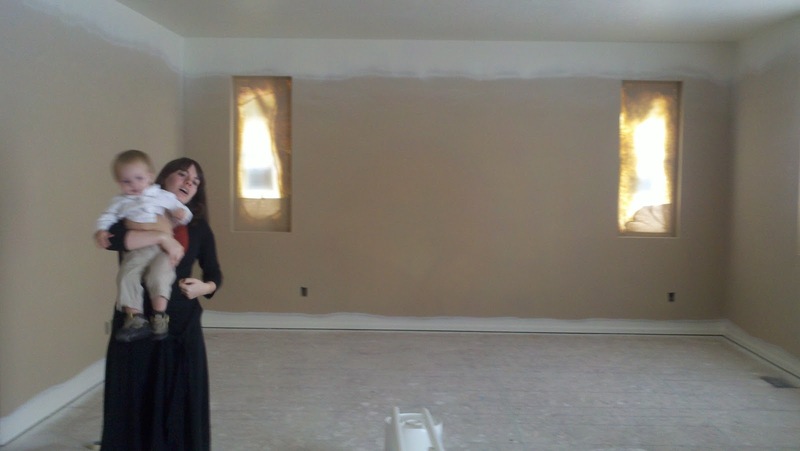 Then as I was thinking about getting things back to normal my sister had her baby 5 weeks early and we spent a few weeks running back and forth to Provo helping her with moving apartments (yeah at 8 months pregnant, yuck) and being in the hospital. It wasn’t until October that I really had time to work on a new routine anyways. I was amazed though at how quickly he dropped off the feedings in favor of solid foods except for his feedings that would put him to sleep (naptime and bedtime). Then he started falling asleep in his high chair while eating lunch, and soon his nap time feeding was gone. It just took a few nights of him skipping his bedtime feeding for me to decide that he was done with that too. Suddenly Sam was weaned and neither he or I hardly realized it had happened. I don’t at all regret nursing him as long as I did. My mom kept pointing out that he was about the healthiest child she’d seen at that age, and really the recommendations are to nurse kids until they are at least 2 years old – despite our American tendencies to want to wean children at a year old. But I’m also kinda glad to be done, I was having a hard time keeping up with eating enough for me, Sam and a growing fetus. I was getting super dizzy and I think it was mostly due to eating for three! Sam however still will beg for “Moo”, although I don’t think he really expects to get it anymore, so I just try to cuddle with him and/or give him a cup of juice/milk/water when he makes that request. I was trying to get a picture of something Sam was doing, but when he saw the camera he hammed it up instead, what a cutie! Sam is really excited for his younger sibling to come. For awhile he was constantly asking “Baby? Christmas?”, to which we responded that Christmas would be a VERY bad time for baby to come, how about Easter? He would just get more insistent, “Baby! 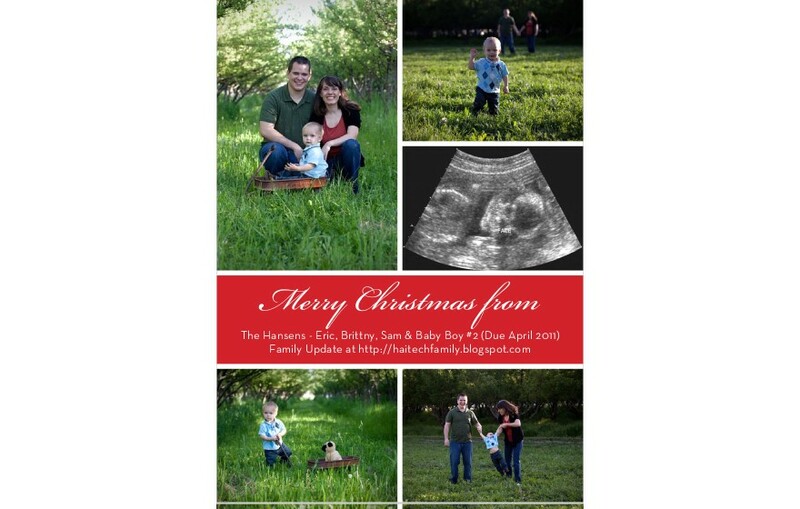 Christmas!” Luckily, we’ve finally convinced him that we can have the baby for Easter instead. Sam likes “playing with” the baby by lifting up my shirt and kissing my tummy, or blowing raspberries or “nuggling” my tummy. It’s really cute! Judging from the way he acts with other kids we think he’s going to transition to having a younger sibling pretty well. 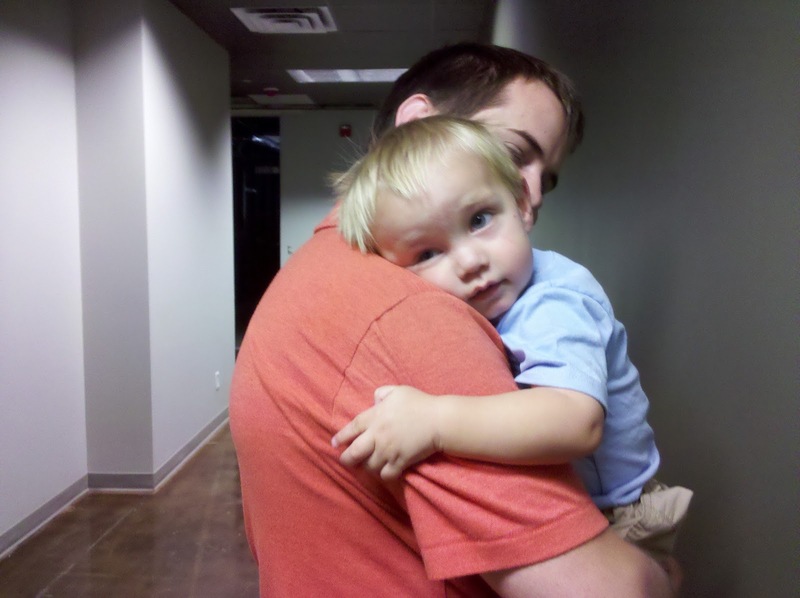 We’ve spent a good amount of time with his cousin Skylar and he loves holding him and playing with him. He’s very sensitive to the baby’s needs as well and will tell us “Baby sad” if Skylar is crying, or “Baby happy!” when he’s about to eat. We have however had to teach him some basics, like we do not “hi-yah” the baby. Also, when we’re done holding the baby we don’t just push the baby off mom’s lap, and if you want mom’s attention we can’t just decide that the baby needs to go to sleep so that mom won’t hold him anymore. There will definitely be some adjustment but it’s nice that he’s at least interested in the baby. Another exciting development is potty training. We’re nowhere near potty trained yet, but Sam will at least make an attempt to do his “ewws” on the toilet once a day. I’m grateful for every diaper that I don’t have to change. We decided rather than making potty training a stressful ordeal we’d just buy a potty seat and see what happened. We have a reward system that he gets “eats” (peanut butter M&Ms) whenever he goes potty. It’s enough of an incentive to keep him motivated to try! In fact, sometimes when he needs to go to the bathroom he’ll tell me “Mommy, three eats!” which roughly translated means “Mom, I need to go poop” (he gets 3 M&Ms for going poop, 2 for peeing, and 1 if he at least makes an attempt).